March 02, 2017, 8:24 a.m.
A new YouGov survey finds that most Britons don’t think it is likely that Labour will be led by Jeremy Corbyn at the next election. When questioned by the press whether he would stand down in the wake of Labour&apos;s defeat at the Copeland by-election last week, Corbyn made it clear that he intends to stay on as leader. The public doesn’t seem to be so sure about Corbyn’s longevity though. When asked how likely it is that Corbyn will still be leader at the next general election, more than half of Britons said they thought that it was either somewhat unlikely (26%) or very unlikely (25%) that Corbyn would still be in place when the country next goes to the polls. Only a quarter of people believe Labour is likely to fight the next election with Corbyn as leader. Labour supporters were the most likely to think Corbyn will continue to be leader, at 31%, but even then a majority (51%) still think it is unlikely Labour will go into the election with him in charge. Conservative supporters are the most sceptical about Corbyn’s chances – nearly two thirds (64%) think it is unlikely that the Islington North MP will remain as leader. The results come days after YouGov found that nearly half of the public believe that last week’s by-election outcomes were bad for Labour. Nearing half (46%) said that the results were either quite bad (26%) or very bad (20%) for the party. Just 8% of people believed the defeat in Copeland and successful defence of Stoke constituted a good result for Labour. 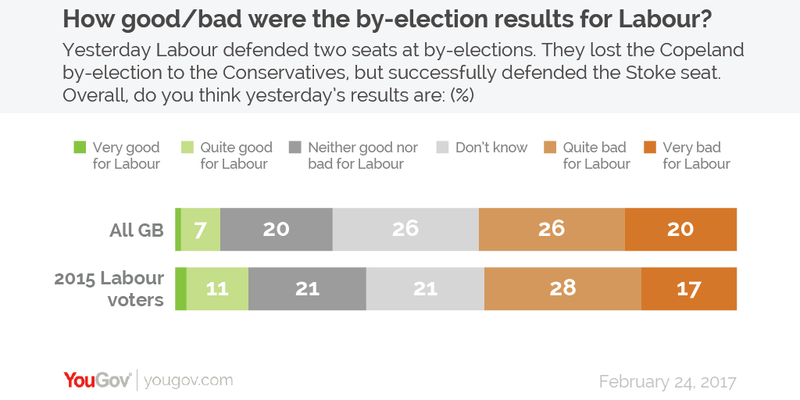 Worse still, the results weren’t seen as much better by Labour supporters with about the same proportion (45%) thinking the results were bad for the party as the general public (46%), although they were a bit more likely to say the results were good for Labour (13%).